Lucie celebrated her 50th birthday two weekends ago. I surprised her with a party, and 30 of her brothers and sisters, friends and even some on my side helped her celebrate. 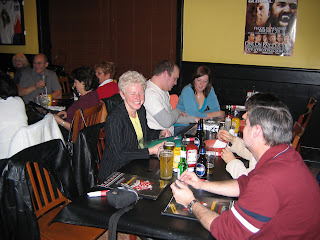 We held the party at Local Hero's on St. Laurent Blvd in Ottawa. Here she is in all her jovial self, smiling, joking and making everyone feel like a million dollars. This post is a bit of the topic of this blog except in one respect. My dream of the Cottage on the Edge would simply not be possible without Lucie's encouragement and her help during many construction voyages. I love her to bits, and can't wait for the spring when all the major construction will be complete, and the travel to the Cottage will be more for relaxation and spending time with loved ones than wielding a hammer.